Is that fitness tracker you're using a waste of money? 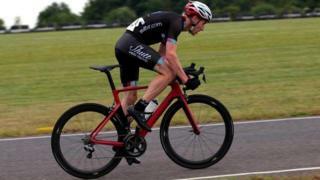 Fitness-tracking devices have helped Peter Dumbreck beat his personal best times for cycling three days in a row. The racing driver and keen cyclist uses a Garmin 810 Edge cycle computer, a heart rate monitor and a power meter. "The power meter is embedded into my left crank arm and talks via Bluetooth to my Garmin device, as does my heart rate monitor," he says. "I can see my power [the force his legs are generating], which is updated every three seconds, on my Garmin screen and through training and experience know how many watts I can maintain and for how long I can do it," he says. Wearable and portable fitness trackers are certainly helping serious athletes like Peter to push themselves to the limit. But what about the rest of us? Does knowing how many calories we're burning, how fast our hearts are beating, and how many steps we've taken really motivate us to do more exercise and eat more healthily? In short, do they really work? "They've made us all aware of how we treat our bodies, and they have even helped people diagnose things like diabetes and obesity," says Collette Johnson, head of marketing at design technology consultancy Plextek. "But I feel they could go further." Last year the University of Pittsburgh concluded that fitness trackers were "ineffective at sustaining weight loss". The two-year study, conducted by the university's School of Education Department of Health and Physical Activity, involved 500 overweight volunteers. All were asked to diet and engage in more exercise, but only half were given a fitness tracker to help them. Image caption Do fitness trackers make us more or less motivated? The study found that the group wearing trackers lost 8lb (3.6kg), but the ones who didn't lost 13lb (5.9kg). "Trackers are a reliable measurement of our activity, but we can't rely on them completely," says Andrew Lane, professor of sport psychology at the University of Wolverhampton. "We can't expect just to buy one and that's it - some of the responsibility sits with us too. We still have to get off that sofa and complete those 10,000 steps a day." Prof Lane believes that, if used inappropriately, they may even start to have a negative psychological effect. "What if we start consistently not reaching goals set for us by them? Ultimately it would lead to us feeling demotivated - the opposite effect they are supposed to have." Such concerns haven't stopped the market from booming - yet. Leading wearable fitness tracker maker Fitbit reported 2015 revenues of £1.3bn, while researcher CSS Insight forecasts that the market will be worth £16bn by 2020. And the fact that smartwatch sales declined sharply last year, according to market analysts IDC, has led many makers to reposition them primarily as fitness-tracking devices - another indication of where the business potential lies. But is the problem with them that they are neither accurate nor sophisticated enough yet? "As well as providing data for us, companies need to provide coaching with this data. They need to take responsibility for the results they're providing us," says Prof Lane. And Plextek's Ms Johnson thinks they need to understand more about the individual user. "They need to recognise whether Sharon from Uxbridge really should be doing two hours of fitness a week, how that's going to impact upon her body, her joints, whether she's at risk of osteoporosis. "Fitness trackers can be too generic, personalising them will motivate us more," she tells the BBC. Apps, like the Slimming World app, may be better for achieving sustained weight loss, she argues, because they allow you to track your weight loss progress and give you incentives after it has recorded your exercise. "There is no doubt the industry is booming, but for it to really see results it needs not only to give us results, but to make them as personalised and as accurate as possible." So what tech innovations are making fitness tracking more effective? Genetics and nutrition firm DNAFit advises on how we should be training and what we should be eating after testing our genes and applying its algorithm to the analysis. You take a saliva swab and send it off to the company's lab. After 10 days a report tells you which exercises your body will respond to best and which foods you should be eating. The company says its technology platform has been peer reviewed and clinically tested. Other companies such as FitnessGenes, Genetrainer and AnabolicGenes adopt similar approaches. Jo Rooney, 35, a deputy headteacher, used the test to try to cure her stomach problems. "My results came back quite quickly and told me that I was actually lactose intolerant and had a high sensitivity to gluten. "This did mean quite a radical change to my diet, and a lot more forward planning, but within a week I felt a lot less bloated, lost weight and I'd stopped having stomach problems." Body scanners and tech built into sports clothes are also giving us more detailed results. For example, Fit3D uses scanners to assess the whole body to calculate body fat percentage, assess posture and give body shape scoring. While last year, OMsignal launched OMbra, a smart sports bra that tracks heart rate, breathing and distance between steps, and shares this data with a smartphone app. Prof Lane believes that we're also going to start seeing biometric devices integrated not just into clothes and wearable devices, but directly on to our bodies as well. For example, US tech firm Chaotic Moon Studios - now called Fjord - has created a prototype tech tattoo - a skin-mounted monitor that connects to your smartphone to monitor heart rate, blood pressure and even track movement via GPS. Now we just need an injection of willpower.